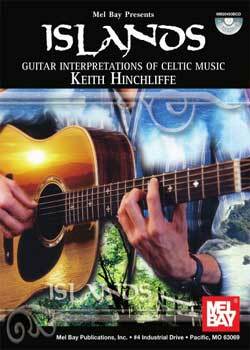 Keith Hinchliffe Islands Guitar Interpretations of Celtic Music PDF + Mp3 CD download. This collection of 23 striking and varied Celtic melodies arranged for solo guitar in altered tunings is presented in tablature and standard notation. The selection spans the Irish, Scots, Welsh and Manx traditions over three centuries and includes slow airs, reels, jigs, hornpipes and strathspeys. Keith Hinchcliffe is a highly regarded solo guitarist, a former member of The Albion Band, an experienced guitar teacher and a workshop leader. His repertoire ranges from blues and ragtime to classical and early music, but he has gained most attention for his distinctive arrangements of Celtic melodies. The album Carolan’s Dream has been widely praised in the British, European and American music press and has been featured in several BBC and Irish radio programs. Download Keith Hinchliffe – Islands: Guitar Interpretations of Celtic Music PDF free and other books from our site. Only high quality PDF scans. Please write a review, it's important for our community.